The purported ISIS-supporter reportedly lectures at the Hume Islamic Youth Centre located in a suburb of Melbourne, Australia, and has a large following of young men.Michael Bachelard and David Wroe, “Islamic State recruiter makes contact with popular Melbourne sheikh,” Sydney Morning Herald, May 15, 2015, http://www.smh.com.au/national/islamic-state-recruiter-makes-contact-with-popular-melbourne-sheikh-20150515-gh1xo9.html. 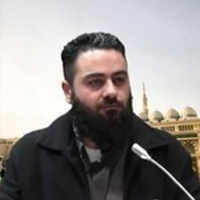 According to the Sydney Morning Herald, he has referred to deceased ISIS recruiter Sheikh Abu Malik al-Nashwan as a “martyr.”Michael Bachelard and David Wroe, “Islamic State recruiter makes contact with popular Melbourne sheikh,” Sydney Morning Herald, May 15, 2015, http://www.smh.com.au/national/islamic-state-recruiter-makes-contact-with-popular-melbourne-sheikh-20150515-gh1xo9.html. 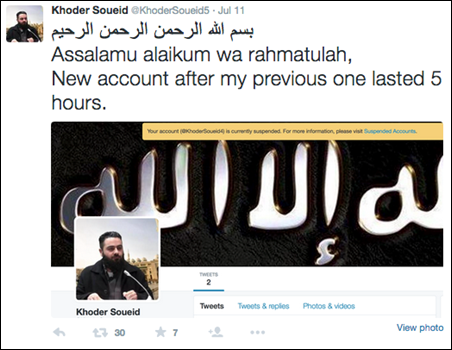 On his suspected Twitter account, Soueid claims to be a graduate of the Islamic University of Medina in Saudi Arabia.Khoder Soueid, Twitter, accessed July 15, 2015, https://twitter.com/KhoderSoueid5. Twitter has purportedly suspended numerous iterations of Soueid’s previous accounts. According to Soueid, one of his accounts only existed for five hours before it was suspended.Khoder Soueid, Twitter post, July 11, 2015, 4:48 a.m., https://twitter.com/KhoderSoueid5/status/619835666986172416. Soueid is able to quickly resurface under a different account. His account under the handle @KhoderSoueid5 gained approximately 500 followers in less than two weeks.Khoder Soueid, Twitter, accessed July 21, 2015, https://twitter.com/KhoderSoueid5. CEP suspects that Soueid creates new accounts on iterations of the @KhoderSoueid handle, adding the number 2, 3, 4, etc. at the end of the handle with each new account. 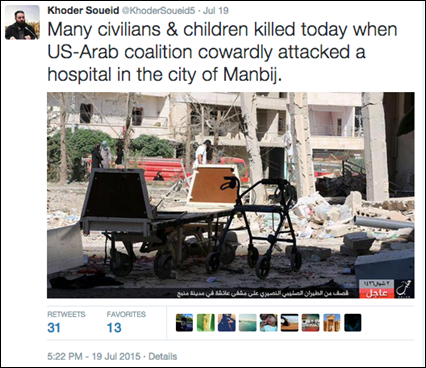 @KhoderSoueid (suspected)Khoder Soueid, Twitter, accessed July 16, 2015, https://twitter.com/KhoderSoueid5. “Kurds expelling Arabs from their villages, burning farms, robbing homes under the watchful eye of the US who acts as a de facto air force.”Khoder Soueid, Twitter post, July 14, 2015, 9:18 a.m., https://twitter.com/KhoderSoueid5/status/620990873145192449. “Assalamu alaikum wa rahmatulah, New account after my previous one last 5 hours.”Khoder Soueid, Twitter post, July 11, 2015, 4:48 a.m., https://twitter.com/KhoderSoueid5/status/619835666986172416. “The proponents of freedom & democracy are violating international law by bombing basic infrastructure in Mosul to degrade living standards.”Khoder Soueid, Twitter post, July 11, 2015, 6:10 a.m., https://twitter.com/KhoderSoueid5/status/619856276013473792. “While we contemplate what to buy our children for Eid [religious feast which marks the end of Ramadan, a holy month for Muslims] others are praying that their children remain alive to see Eid.”Khoder Soueid, Twitter post, July 11, 2015, 6:23 a.m., https://twitter.com/KhoderSoueid5/status/619859634740801537. “Jannah [Islamic conception of paradise] has a price, It’s called sacrifice.”Khoder Soueid, Twitter post, July 13, 2015, 5:04 a.m., https://twitter.com/KhoderSoueid5/status/620564351221563393. “O Allah [God] show us the truth as truth & allow us to follow it, & show us falsehood for what it is & give us the ability to abstain from it.”Khoder Soueid, Twitter post, July 13, 2015, 6:04 a.m., https://twitter.com/KhoderSoueid5/status/620579607897444352. “Sell this life for the next and you win both of them. Sell the next life for this and you lose both of them” –Al Hasan Al Basri.”Khoder Soueid, Twitter post, July 13, 2015, 6:06 a.m., https://twitter.com/KhoderSoueid5/status/620580154306269188. “This is how the US-Arab coalition planes help Muslims in Syria prepare for Eid & yet our ‘scholars’ will remain mute.”Khoder Soueid, Twitter post, July 13, 2015, 9:18 a.m., https://twitter.com/KhoderSoueid5/status/620628331583516673.